WESCA exhibited exciting paintings, photographs, sculpture and ceramics at Vida Comida in the Swan Yard, Sherborne as a part of Dorset Art Weeks 2018. 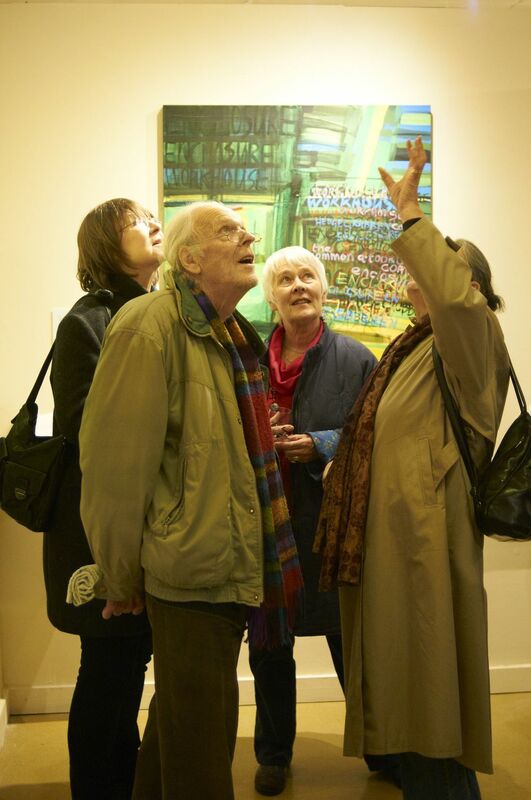 Elizabeth Adams, Aleathea Lillitos , Kevin O-Brien, Justin Orwin, Louise Roll, Jo Saurin and Helen Simpson were featured in the show, together with samples of work by other members of the group. Summer 2017 - we held our first show upstairs at Vida Comida in Sherborne, a 'POP-UP' - organised fast - successful and fun. In Far From The Madding Crowd Hardy writes: 'The sky was remarkably clear – and the twinkling of all the stars seemed to be but throbs of one body, timed by a common pulse..' Where there's a pulse there's a life force and it belongs not just to individual human beings but, as Hardy reminds us, there's an ancient pulse in the earth and a pulse in the sky, a 'common pulse.' Art is one of means by which we take that pulse, listen to it, respond to it. I would like to close with a story that is, in one way, a kind of warning about the liberties that art can take: yes it is good to dream, to have flights of imagination, but at the same time there is a responsibility to be anchored in the real. In the mid 1960s, when the film director John Schlesinger brought a crew to Dorset to make his dreamy adaptation of Thomas Hardy's novel Far from the Madding Crowd, a farmer in our village was asked to supply the sheep that would appear in the scene where Gabriel Oak (played by Alan Bates) loses his livelihood as a shepherd when a wayward dog of his drives his flock over the edge of a cliff. The story goes that when the film was premièred in Dorset there was a good number of shepherds in the audience. As Gabriel Oak's tragedy unfolded on the screen, a spontaneous and contemptuous peal of laughter filled the cinema – the shepherds had easily spotted the continuity error. The sheep corpses littering the beach were a different breed from the ones that had been harried on the cliff-top. The film makers had gone to Jack Norman's slaughterhouse at Bradpole to access the bodies of sheep without a thought to differentiation between breeds. They weren't tuned to the earth's actual pulse. Their dream was not anchored enough in reality. They thought that any old sheep would do! None of the works of art in this exhibition are exactly alike; they do not conform to an abstract type: they are unique expressions of earth's ancient pulse of germ and birth. DURLSTON July 2015. Next Year we will be exhibiting in Durlston with an exhibition entitled "On The Edge"
Preparations are underway and we will continue to report updates as and when. It should be an exciting exhibition. 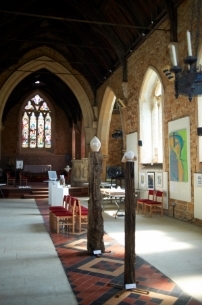 WORK IN PROGRESS - Eype Church (Centre for Arts) . 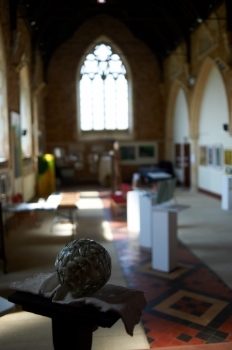 We have just completed a very successful exhibition at Eype Church. With a footfall of over 250 over the 8 days it gained many favourable comments and several significant sales. We will be returning to Eype soon we hope as we love exhibiting there. It is quiet and off the beaten track but the exhibitions there all have a wonderful atmosphere. ( Pictures to follow soon). ENCOUNTERS Dorset County Museum 2013. This exhibition was a tremendous opportunity for the group as a whole. 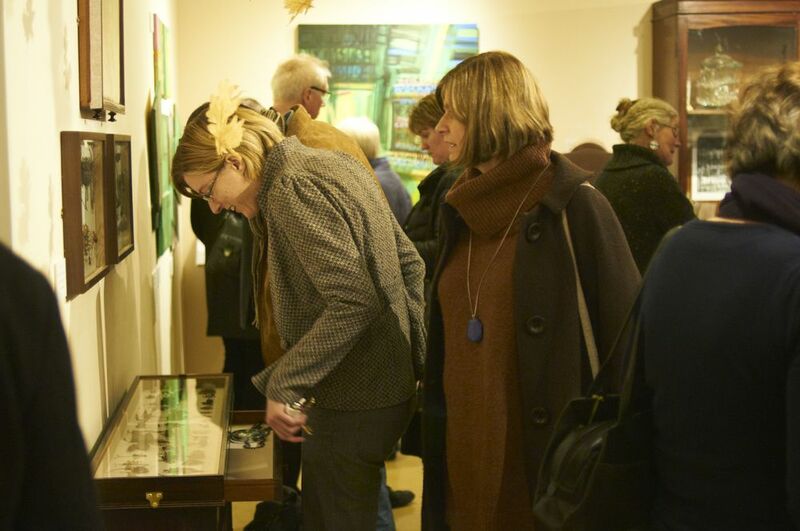 The exhibition was centred around work inspired by artefacts and memories found in the museum and as a result the exhibition was diverse and exciting. It was well attended and of much interest to the public. Pictures below from the PV.